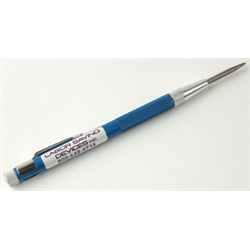 This Automatic Centre Punch can be operated with one hand to easily punch a starter dimple into many materials including wood, metal and plastic, saving time and increasing accuracy when starting fasteners or drilling holes. The punch tip is made of hardened steel and the main body of blue anodized aircraft grade aluminum. The punch features a pocket clip attachment, making it easy to carry with you. The tip can be re-sharpened when necessary using a table mounted grinder, drill mounted grinding wheel or a Dremel tool.